21 January 2013 – Philippine Ambassador to Portugal Philippe J. Lhuillier cited the long historical, cultural and religious ties shared by the Philippines and Portugal when he presented his credentials to President Anibal Cavaco Silva as Ambassador of the Republic of the Philippines to the Portuguese Republic at impressive sceremonies on January 14. Ambassador Lhuillier and party were fetched in the morning of January 14 by a Portuguese Protocol motorcade for the ceremonies. He was accompanied by Deputy Head of Mission and Consul General Josefina Estrada and Third Secretary and Vice Consul Rogelio Villanueva Jr. Following an age-old tradition, a mounted horse Honor Guard was bestowed on Ambassador Lhuillier at the Praça do Império in front of the historic Jerónimos Church and Monastery. 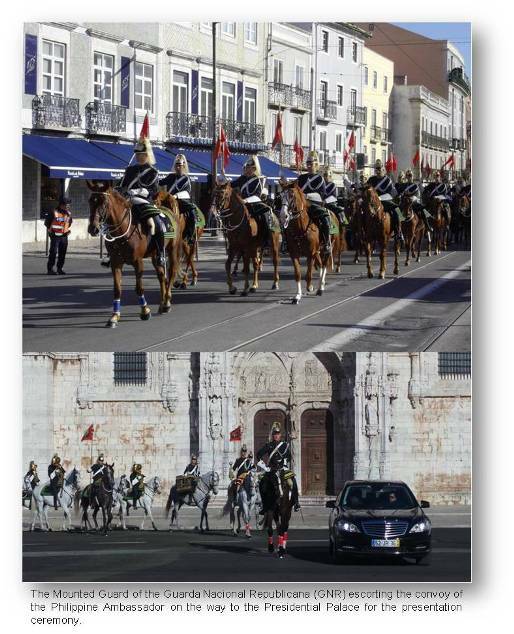 After receiving a military salute, the convoy carrying Ambassador Lhuillier and Embassy officials was escorted by the Mounted Guard of the Guarda Nacional Republicana (GNR) on the way to the Palácio de Belém, the official residence of the President of Portugal.